Sunday was about as fun a day as we ink-stained pixel-pushing reporters get. Two Assembly Members, plus four other drivers, decided to stand in public to decry congestion pricing. Except scores of congestion pricing supporters found out, and staged their own counter-protest. Not that we’re picking sides, but it is absolutely thrilling to hear members of the public scream expletives in the face of elected officials, who aren’t used to being confronted so vigorously. 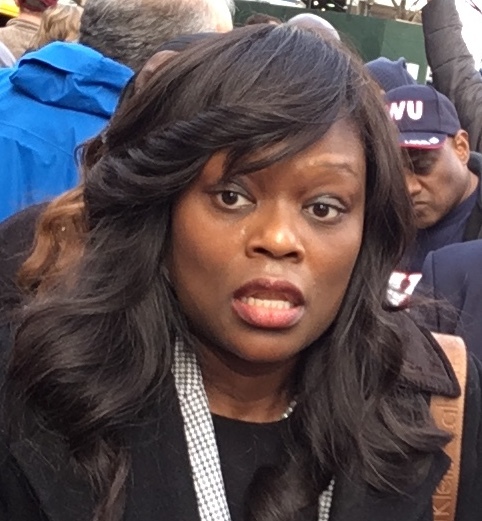 The main target of the protesters’ ire was Brooklyn Assembly Member Rodneyse Bichotte (left), who has now earned two straight days of “Did Rodneyse Bichotte really say that?” coverage in Streetsblog. Yes, people, she did. Vin Barone at amNY played it straight. There was a lot of coverage of the death of pedestrian Erica Imbasciani, who was run down by a hit-and-run driver on Friday night on Amsterdam Avenue in Upper Manhattan. Streetsblog focused on the fact that Community Board 9 has long resisted a city plan to reduce speeding on the wide roadway. Meanwhile, the Daily News mentioned street safety, but focused mostly on Imbasciani’s hopes of becoming an actress. The Post also did the standard “she was an aspiring actress” thing. DOT Commissioner Polly Trottenberg told Gotham Gazette that we should be building three subways stations per year because of rising population. Too bad she doesn’t control the MTA! Friend of Streetsblog John Donohue got a write-up in the Times for his restaurant art. Bklyner had an interesting story about a toddler run over in Brooklyn. “Last July, for a little over 24 hours, “no parking” signs appeared on a stretch of Queens Boulevard in Forest Hills. The city’s Department of Transportation had placed the signs there in anticipation of a project workers within the department, as well as transit advocates, were long excited for: new bike lanes along an eastern portion of Queens Boulevard, traditionally the borough’s most dangerous thoroughfare. Textbook example of a wayward, corrupt politician. Clearly not concerned with representing any majority. She belongs with Trump. 72% of all NYC residents live within 1/2 mile walking distance of a subway stop. The promised benefits from congestion pricing for the 28% living beyond walking distance to a subway are nil. This is an accurate statement because there have been no performance promises linked to the congestion pricing proposal. For residents of 13 of NYC’s 63 assembly districts, fewer than 50% live within walking distance of a subway system. Their assembly members who oppose the current congestion pricing proposal are reflecting the interests of the majority of their constituents. The current congestion pricing proposal proponents should not be surprised by their opposition. I was pleasantly surprised to see the papers cover the victim’s aspirations and the loss thereof. I wish they would do this even when the driver isn’t high/stays on the scene rather than the usual focus on the poor, distraught driver. Wouldn’t getting people out of cars and into transit create demand for, and provide space — literal and political — on the streets for bus lanes? The underlying story if DeBlasio panders to special interests at the expense of the future and those who live it is this. Thanks to Generation Greed the promised benefits for the 72% living near the subway are also nil. Congestion pricing is insufficient to even prevent subway system degradation — just slow it down by replacing some of the stuff that wears out and hits 75 years old. What is being promised? MAYBE some additional handicapped access, which only benefits some of the handicapped. But probably not. Meanwhile, it is possible that East Side Access will actually be built someday. As taxes are increased over and over again in the future, it won’t be for promised benefits. It will be for Generation Greed. This entire dance is about not saying so, and you are playing along. Is there a 30mph zone nearby, or is Bklyner unaware that the city speed limit is 25mph? Bus lanes are not the panacea for those living beyond walking distance to a subway station. The first mile bus trip has to have a destination. That destination is the subway terminal. The intersections leading to the major subway terminals are scheduled to handle more bus trips per hour than they can handle without coming to a crawl. The number of hourly scheduled bus trip crossings at these intersections exceeds guidelines for trolley cars that were developed before Moses in the 1920’s. The only way out is to extend the subway to where it ain’t. Buses or any other at grade solution won’t hack it.